[Rumor] Is this benchmark for the Verizon Galaxy S4? 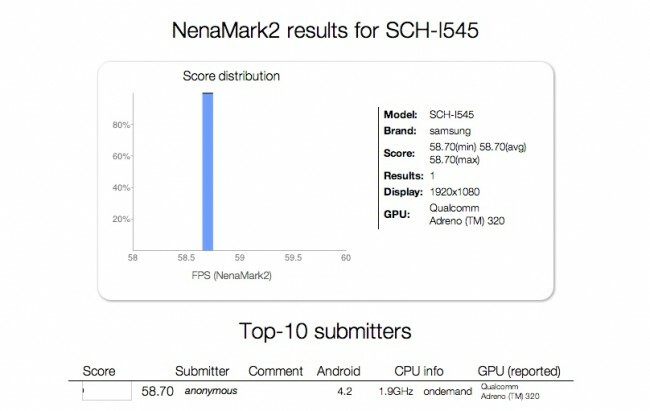 A recent benchmark showed up for a smartphone with the device ID “SCH-I545” – this just may be the latest flagship from Samsung, the Galaxy S4. The Galaxy S3 for Verizon bore a device ID of “SCH-I535” and several other Samsung smartphones have similar code names on Verizon as well. As you can see from the bench mark, we’d expect this phone to sport a Qualcomm Snapdragon processor, a full 1080p display, and the Adreno 320 GPU. The Samsung event is scheduled for 03/14/13, and no doubt it will be one of the most hyped events of the year for tech enthusiasts. [News]Qualcomm RF360: The Holy Grail of LTE modems? The Qualcomm RF360 is the modem we’ve been waiting for, the Holy Grail of LTE ! Why is that you might ask? Because it’s the first modem that covers all global LTE frequencies – 40 in all. Why is that important to you? The answer is that the RF360 would allow Google to make a subsidized Nexus, or Motorola X-phone that would work on any carrier’s LTE network. Google’s goal of being able to free customers from expensive carrier contracts and offering cheap unsubsidized phones that work on any network may finally be a reality. Google I/O starts on May 15th and the Motorola X-phone is expected to be announced. Hopefully it will be the first global LTE smartphone. Would it be too much to hope that Google sells it directly through the Play Store at the same price points as the Nexus 4? Hey, we can dream, right? It’s clear Sony worked hard on the Xperia Z. The design is excellent and the hardware is top notch. I thought Sony had a winner on its hands. Then I read the review on Engadget yesterday and saw the battery rundown result for the Z.
Hopefully Engadget just got a defective unit, because otherwise unless you’re planning to use the Xperia Z as a really nice paperweight you should probably stay away. The rumors have ended…HTC has launched their new flagship phone – the HTC One. No longer the rumored “M7” device, this new smartphone really pushes the envelope when it comes to high end devices, from HTC or any other manufacturer. This bad boy sports a 1.7GHz quad core Snapdragon 600 processor, 4.7″ 1080p display, 2GB of RAM, and a generous 2300mAh non-removable battery. Certainly nothing to sneeze at in terms of spec. The edge to edge display and “zero gap” aluminum body are very cool, and in terms of design, HTC has a winner here. The official press release is below – coming soon to Sprint, AT&T, and T-Mobile. Yep…Verizon isn’t in that list and no mistake. Good news for all you Droid DNA lovers…your phone isn’t outdated just yet. London and New York City, February 19, 2013 — HTC, a global leader in mobile innovation and design, today announced its new flagship smartphone, the new HTC One. Crafted with a distinct zero-gap aluminum unibody, the new HTC One introduces HTC BlinkFeed™, HTC Zoe™ and HTC BoomSound™, key new HTC Sense® innovations that reinvent the mobile experience and set a new standard for smartphones. At the center of the new HTC One experience is HTC BlinkFeed. HTC BlinkFeed is a bold new experience that transforms the home screen into a single live stream of personally relevant information such as social updates, entertainment and lifestyle updates, news and photos with immersive images so that people no longer need to go to separate applications to find out what’s happening. HTC BlinkFeed aggregates the freshest content from the most relevant and interesting sources, giving it to people at a glance, all in one place, without the need to jump between multiple applications and web sites. To enable this innovative camera experience, HTC developed a custom camera that includes a best-in-class f/2.0 aperture lens and a breakthrough sensor with UltraPixels that gather 300 percent more light than traditional smartphone camera sensors. This new approach also delivers astounding low-light performance and a variety of other improvements to photos and videos. In addition, the perfect self-portrait or video is just a tap away with an ultra-wide angle front-facing camera which supports 1080p video capture. Multi-axis optical image stabilization for the rear camera also helps ensure video footage smoother whether stationary or on the move. HTC UltraPixelcamera adds many other features and effects such as enhanced 360′ panorama, time sequencing and object removal. HTC Sense TV transforms the new HTC One into an interactive program guide and remote control for most TVs, set-top boxes and receivers. Tapping the power of the cloud, Sense TV makes it simple and intuitive to see what’s on and find that favorite show. Wrapped in a zero-gap aluminum unibody and sporting a brilliant 4.7”, Full HD (1080p) screen, the new HTC One features the latest Android Jelly Bean operating system and LTE network technology to offer blazingly-fast browsing in a package that combines premium design with breakthrough build quality. Available in stunning silver and beautiful black, the sleek and crafted aluminum unibody sits comfortably in the hand and showcases HTC’s unique antenna technology, which helps people achieve a crystal clear signal. The display also resists scratches and reduces glare, whilst offering incredible 468ppi resolution and rich, natural colors. [Rumor] HTC M7 to be released at "HTC One"
HTC is getting ready to launch that flagship that’s for so long been known as the M7 – until the latest rumor has surfaced. The latest news from HTC is that the new device could actually be known simply as the “HTC One.” This would put it in line with previously released devices like the One X, One S, and the One X+ – however; this might end up confusing consumers, as all these other devices were released before this newest one. To top it off, the M7 most closely resembles the recently released Droid DNA, released on Verizon, and if Verizon gets the M7, its unclear why the Droid DNA would have ever been sold to begin with. It’s no secret that around here, the 2 Tech Geeks are puzzled by HTC’s business strategies of late, most notably with the battery technology they put in their phones. In any event, HTC has a long road ahead of it if they want to get back into the smartphone race…does anyone think the rumors of the M7 device are the way they do it? [Rumor] LG to push up launch date of Optimus G Pro? In advance of the juggernaut that will likely be Samsung’s Galaxy S4 launch, LG is rumored to be considering launching their new flagship, the Optimus G Pro, later on this month – probably near the end of February. Why do this? To hopefully steal the Galaxy S4’s thunder, of course! Well…its probably more along the lines of hoping to get consumers to purchase the not-unimpressive Optimus G Pro before they get wind of the GS4. For a full spec sheet on the Optimus G Pro (OGP? ), check out this article.